At the RHS Chelsea Flower Show – a ‘selfie’ taken as a reflection in the in the polished steel garden arches of the “Positively Stoke-on-Trent” exhibit. To the right is a Moorcroft Pottery sphere featuring images of plants in the show garden. Great exhibit! I was so delighted to finally meet and have a chat with the so-called “Housewife’s Choice” of English female gardeners of a “certain” age. For those of you reading this in America, Alan is a charming man and THE Superstar of English gardening. A prolific garden writer and a champion of all things horticultural, Alan has taken on the challenge of designing a garden to celebrate the 50th Anniversary of “Britain in Bloom”. for he RHS. This civic beautification program started not long after the Second World War. Begun to re-invigorate the British gardening interest and to brighten up towns and villages across the country, it has achieved this goal and then some. Gardening together has helped communities to feel more local pride and that pulling together spirit that I was always told as a child was there during the war.A little friendly competition between neighboring villages does not hurt either. 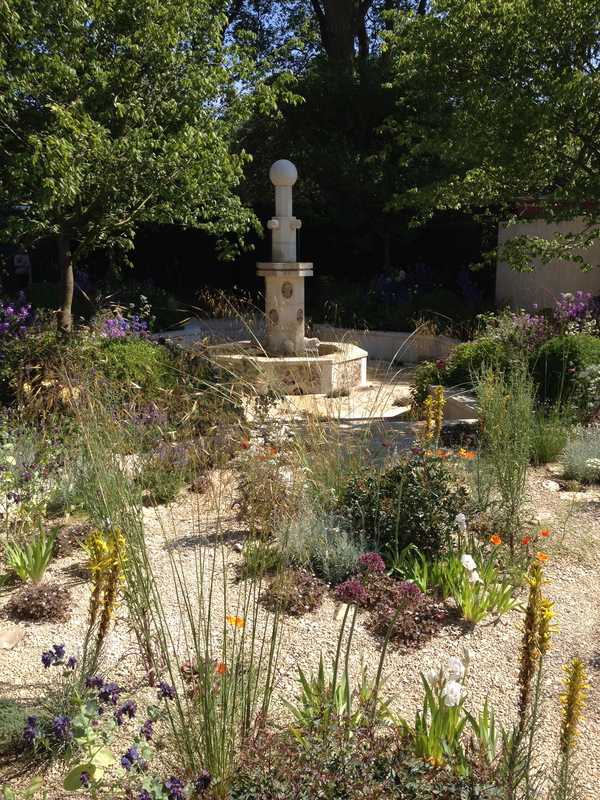 Alan worked with another Chelsea Gold medal winner, Kate Gould, to design and implement this gaden that shows the diversity of plants that can be grown in the British Isles. 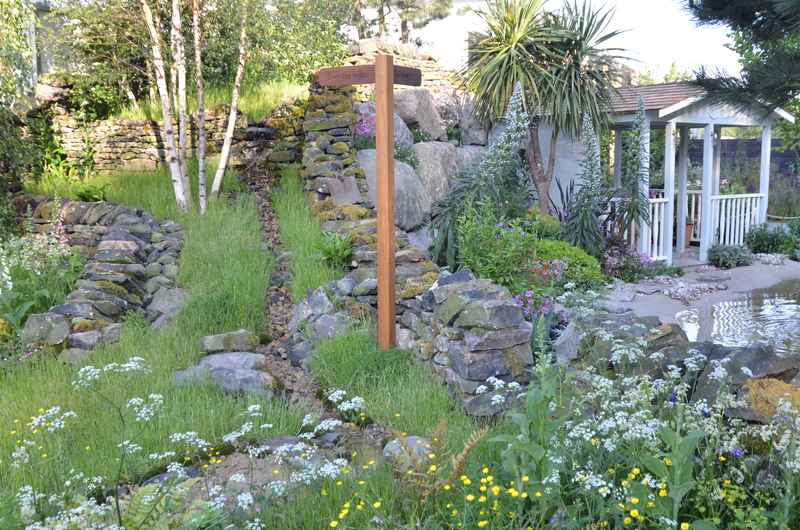 The back of the exhibit is a representation of Alan’s native Ilkley Moor in Yorkshire, complete with a dry-stone wall removed from the Moors and re-installed here at Chelsea. Silver Birch trees dot the grassy areas as the slope falls down to the pool and cabin that represent the more temperate growing area of Alan’s present home on the Isle of Wight. The garden is a fitting tribute to both Alan’s fifty years in gardening and the half a century of Britain in Bloom. 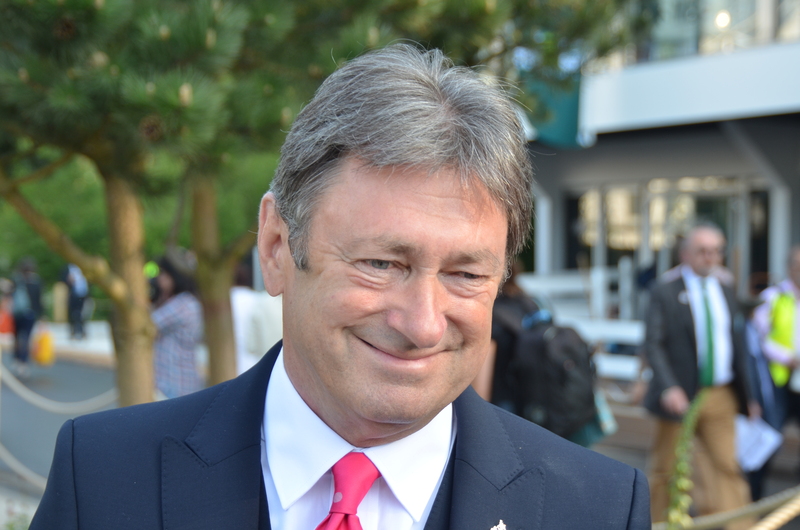 “From the Moors to the Sea” Alan Titchmarsh and Kate Gould designed this RHS Chelsea Flower Show exhibit. M&G Investments is the show sponsor of the RHS Chelsea Flower Show; their garden, designed by Cleve West, is based on ancient Persian garden designs but with a modern twist. The design is divided into the traditional four quartered sections with a sunken central carved stone fountain and four watery rills. The yew hedges and carved limestone panel behind the fountain provide the feeling of an enclosed oasis. Plants to the left are of the blues and purples and to the right there is jellybean-colored floral display set in an arid, pebbly area suggesting the geographic home of the original design inspiration. As usual Cleve West does not disappoint. His design and plantings pack a horticultural punch to whisk the visitor away to what I was going to call warmer climes- but today I cannot do that as the day was sunny. bright and downright hot at times. A perfect way to begin Chelsea Flower Show week.